Order your Advanced Tech International Laserprint 800 refill toner on our TonerTopUp website now! The Advanced Tech International Laserprint 800 is one of a range of models sharing a common "engine". These may be badged by different manufacturers. They have the following range of cartridges. Do not be concerned if the refill toner for your Advanced Tech International Laserprint 800 has what appears to be an unrelated name. This is because of the sharing of the engine between different makes and models. First of all prepare your worksurface. Working in an area of subdued light, cover your work surface with some newspaper. You may choose to wear latex gloves or use a dust mask. Take care not to touch or damage the imaging drum on the bottom of the Advanced Tech International Laserprint 800 toner cartridge. Greasy marks or nicks in the surface will ruin the print quality. The key tool in our starter kit is a standard soldering iron with a specially designed tip. This makes it very easy to make a hole in the Advanced Tech International Laserprint 800 toner cartridge. Just plug in the soldering iron, let it heat up for three minutes. 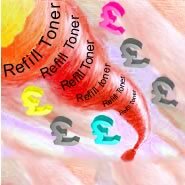 Then give the toner bottle a good shake to get air into the powder so it flows easily, remove the top and seal and screw on the spout shaped cap supplied with the Advanced Tech International Laserprint 800 refill toner. You can now pour the Advanced Tech International Laserprint 800 refill toner into the Advanced Tech International Advanced Tech International toner cartridge leaving an air space at the top. Wipe any loose Advanced Tech International Laserprint 800 refill toner off the outside round the hole with a duster. Seal the hole with one of the plastic grommets from the kit (or a bit of sticky tape) so that it does not leak. Click here to view information on our products for the Advanced Tech International Laserprint 800 and to order!